황해도평산소놀음굿은 무업을 전문으로 하는 무당이 소모양으로 꾸미고 농사의 풍년과 장사의 번창, 자손의 번영을 기원하며 노는 굿놀이로서 정확한 기원은 알 수 없으나 조선시대에 형성된 것으로 보인다. 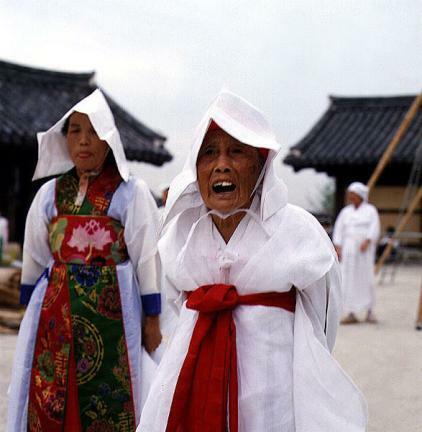 소놀음굿은 단독으로 하지 않고 제석거리에 이어서 하는데, 이것은 제석거리가 자손의 번창과 수명을 연장하는 성격을 띠고 있어서 소놀음굿과 비슷하기 때문이다. 황해도 평산 소놀음굿은 기호와 해서 지방에서 놀던 놀이로 강한 종교적 성격을 띤다. 굿은 해질 무렵에 시작해서 다음날 새벽까지 계속된다. 굿판은 앞마당에서 6명의 여자무당이 장구와 징, 저나 피리를 가지고 굿놀이를 벌인다. 마당에는 팔선녀가 내려오는 여덟 개의 무지개를 상징하는 천을 늘어뜨리고 그 밑에는 팔선녀가 내려와 목욕하는 곳이라 하여 큰 물통에 바가지 여덟 개를 띠운다. 흰장삼에 고깔을 쓴 무당은 삼불제석역으로 나와서 옥황상제의 명을 받아 지상에 내려와 인간을 탄생시키고 조선을 개국한 내력을 노래한다. 이때 바지저고리 차림에 벙거지를 쓴 마부가 소를 끌고 들어온다. 소는 어미 논갈이소와 송아지로 종이로 만든 소머리를 손에 잡고 짚으로 만든 자리를 뒤집어 쓴다. 제석은 마부와 소가 들어오면 이야기를 하며 노래를 부르고, 마부는 소를 끌고 다니면서 밭갈이를 한다. 이때 치마저고리에 수건을 쓰고 바구니를 든 애미보살이 씨를 뿌리며 뒤따르고, 치마저고리에 호미를 든 지장보살이 김을 매면 갓 쓰고 도포 입은 신농씨가 농사일을 감독하는 시늉을 한다. 이어서 소부리기와 쟁기의 바닥에 삽모양의 쇳조각을 맞추는 법을 가르치기, 방아찧기, 지경다지기, 아이만들기 등의 놀이를 하면서 농사법과 복을 준다. 제석은 소를 타고 나졸들은 춤을 추며 굿판을 돌아 서천서역국으로 가는 것으로 소놀음굿은 끝난다. 굿에 등장하는 삼불제석과 애미보살, 지장보살은 불교의 신들로, 지상에 내려와 고통받는 인간에게 복을 주며 좋은 길로 인도하는데, 이것은 평산 소놀음굿에서만 볼 수 있는 독특한 장면이다. 평산 소놀음굿은 평산 출신의 무당 장보배가 해방 후에 소놀음굿을 재현함으로써 오늘날에 이르고 있다. 황해도평산소놀음굿은 무업을 전문적으로 하는 무당들에 의해 진행되는 놀이이지만 불교적인 성격이 매우 강하고 오락성과 예술성을 지니고 있는 놀이로서 주민들의 풍요를 기원하면서 화합을 다지는 기회도 제공하고 있다. 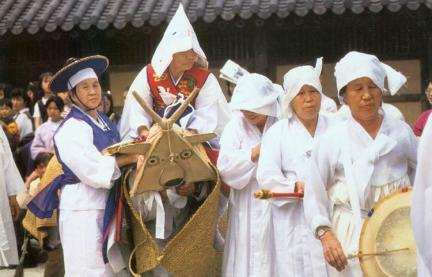 In this performance, an exorcist disguised as an ox prays for a good harvest, good commercial business, and success for children. 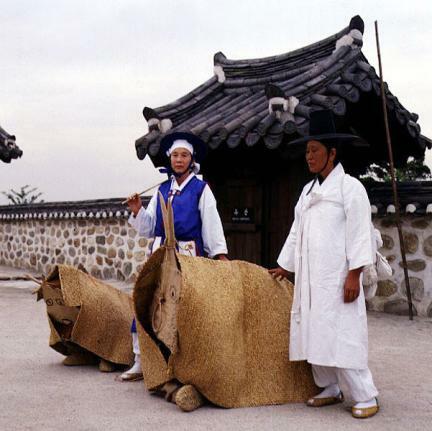 It is presumed that the performance started during the Joseon Period (1392 – 1910). 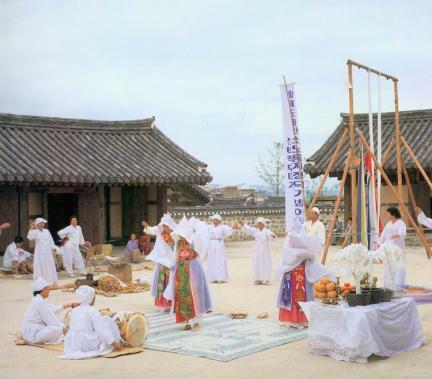 This performance is preceded by Jeseokgeori (Ritual Song for the Deity Jeseok) that is said to control things relating to longevity, grains, clothes and fortune/misfortune. 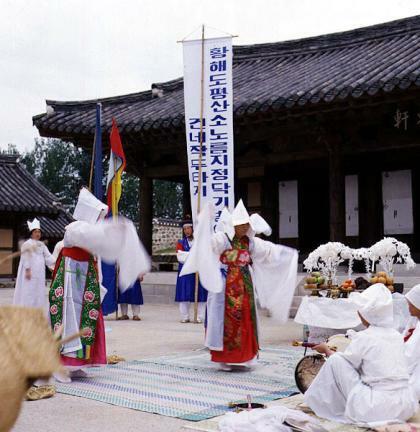 It used to be held in Giho and Haeseo, Hwanghae-do. 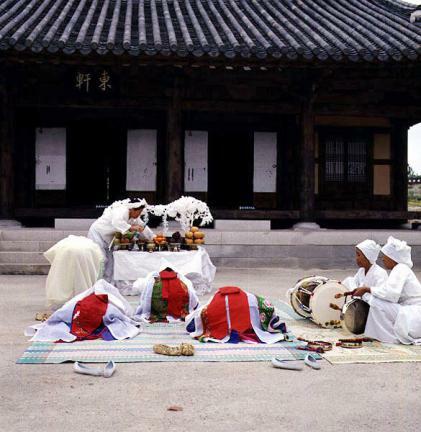 The performance starts around sunset and continues until the daybreak of the following day. 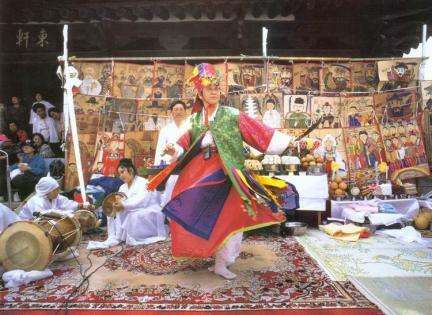 Six female exorcists play janggo (hourglass-shaped drum), jing (large gong), jeo (bamboo flute), and piri (flute). Eight fabric straps are hung from above indicating the path through which Eight Heavenly Maids will descend. At the bottom of the fabrics are placed eight tubs, where the fairies will take a bath. 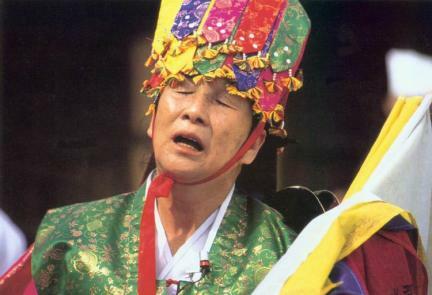 An exorcist disguised as Sambuljeseok (Three Heavenly Deities) in a white robe and a hat sings a song about how he arranged the foundation of Joseon as instructed by the Jade Emperor of Heaven. By this time, a cowman appears, leading a cow. 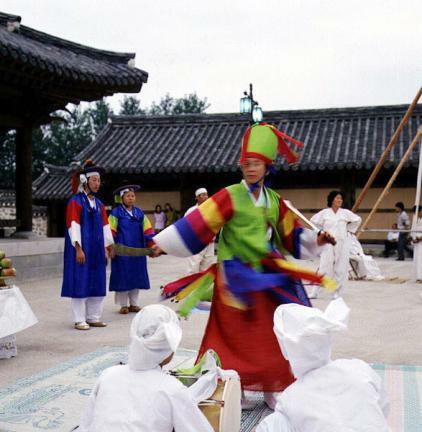 The performance ends with a scene of the deity Jeseok taking a trip to Seocheon Seoyeokguk (ancient India), while patrolling officers engage in a round of dance. 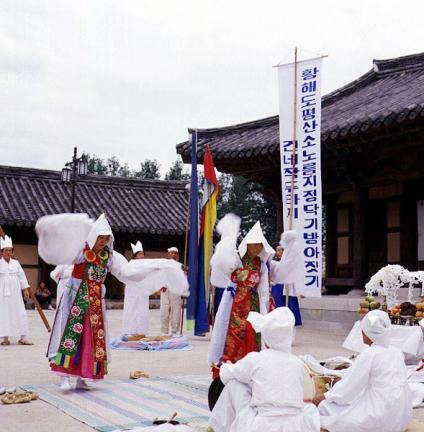 Buddhist deities appearing in the performance, including Sambuljeseok Buddha, are a unique sight that cannot be found in any other exorcism performances. 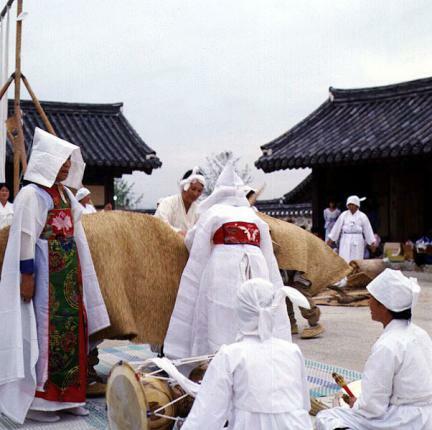 Pyeongsan Sonoreumgut (Shamanic Ox Performance of Pyeongsan, Hwanghae-do) was able to be maintained thanks to Jang Bo-bae, an exorcist from Pyeongsan, who continued the performance after the country’s liberation. 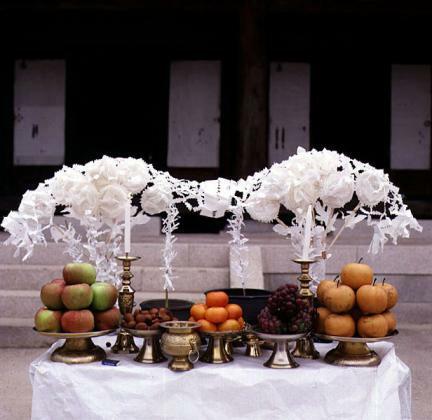 As an event strongly influenced by Buddhism, the performance also combines elements of entertainment and high artistic quality. It serves as an occasion to pray for the happiness of local people and to strengthen the ties among them.